Yeah.. It was a good risk, now it is a great idea. Offer to swap with the browns and get a 2nd and let them take Baker and we take rosen/darnold at 4? Hang it up and wait for ringing. Ask for throwing in Joe Thomas. He may unretire to play for Jets. lol. I’ll give you the first part but I’m sorry the second just isn’t true. Mark has legit failed everywhere lol, no more shoulda coulda woulda’s with him. He sucked. We have to do better with this pick. Even if that means Darnold which it very well may be. In my opinion, quarterbacks are like fruit. They're delicate. You have to decide what you want to do with them early on, whether it be to freeze them, dry them, bake, make juice out of them, etc. But there's a slim window to do that. Once that window passes, you can't just expect to say "you know what, I think I'm going to freeze these berries so I can make smoothies later." It doesn't work that way because the fruit has already become rotten. You also can't expect to freeze one day, then bake another, then make dry fruit the next. You have to have a plan in order to turn your "lemons into lemonade" so to speak. Idk where that analogy came from, but that's what I believe. It's very rare for a QB like Alex Smith to go into a horrific situation and somehow come out of it to become a top level QB. Very rare. For the most part, a QBs foundation for success is created in years 1-4, and once they get over that hurdle we witness their play blossom. Sanchez had a **** offense, **** coaching, and a **** team philosophy to build his foundation. All that while he was extremely raw. They changed schemes, they hired bad coaches, they wasted money on bad players. He should have NEVER been asked to start week one. Given what happened in New York, I find it hard to expect him to be able to go somewhere else and miraculously be better there; his career was wasted with the Jets and his confidence was shot. That's the story on him. I think Darnold is better at almost everything than Sanchez. I agree, but I'm saying situationally and stylistically. 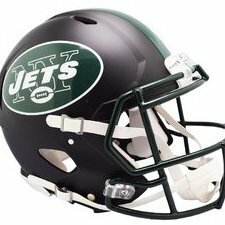 I find it really hard that the jets pass on Darnold if he is their. I think the Jets are putting smokescreens out so pick 1 or 2 will be Rosen leaving Darnold and Mayfield for the Jets. Look good you play good. And we still don’t understand how you have come up with your QB rankings. I feel like someone switched the names of the tape you are watching and you actually want Rosen but think his last names Allen. It’s not your fault. I’m really just messing with you. We all have our preferences at the end of the day, but what’s exciting is there will be a new young, talented QB for this team to build around. I dig it.